The pompous travel of il Duce to Hitler became legendary, last not least by Charlie Chaplin’s comedy. A really great train Berlin - Rome however did not exist. 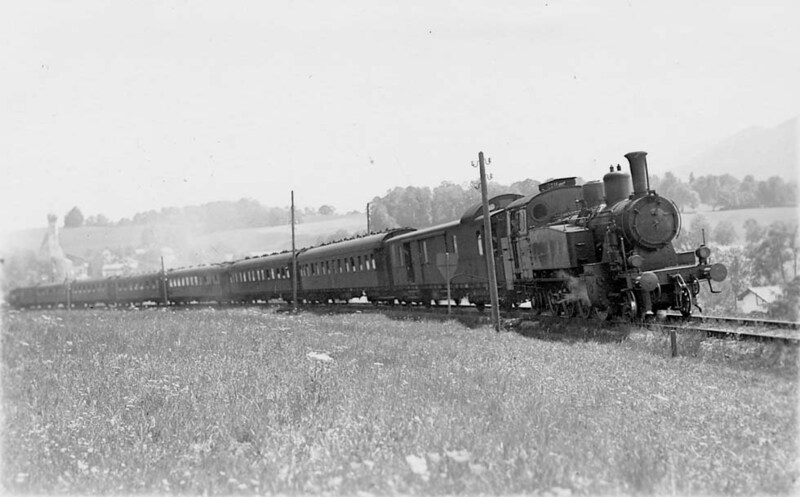 The Riviera-Napoli-Express of 1931 has become a Riviera-Express, only with a single sleeping car from Berlin to Rome and it ran through neutral Switzerland. The prestigious FD Berlin-Munich, on the electrified section hauled by the dark-red E19, built for 180 km/h, had only a single Italian through car to Rome. 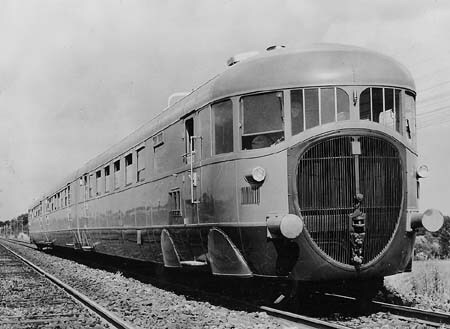 On the other line from Berlin southward, via Frankfurt, the streamlined Niagara 06 series during test runs proved useless due to its long-boiler, a Nazis’ design principle. The dream in Mussolini’s Italy of a fast diesel railcar (the ATR 100) Milan-Brenner-Munich had not materialized, neither Hitler’s mad ideas of a north-to-south axis railway, for which some tunnels in Northern Norway had been built and electric twin-locomotives were planned, a sort of two E94 freight engines (no twin-E19!). 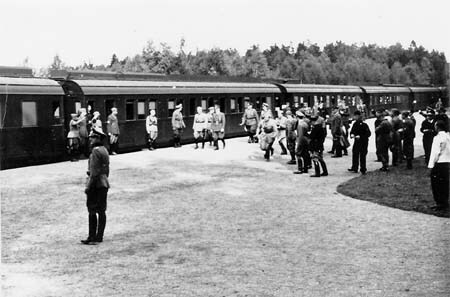 German soldiers had special trains through Sweden. Between Germany and Italy for a short time sleeping-cars Munich - Reggio and Taranto appeared, confiscated CIWL “Carozze Letti - Servizio Italo-Germanico”. After the war came the Medloc, carrying British Mediterranean forces home (see chapter Orient-Express). 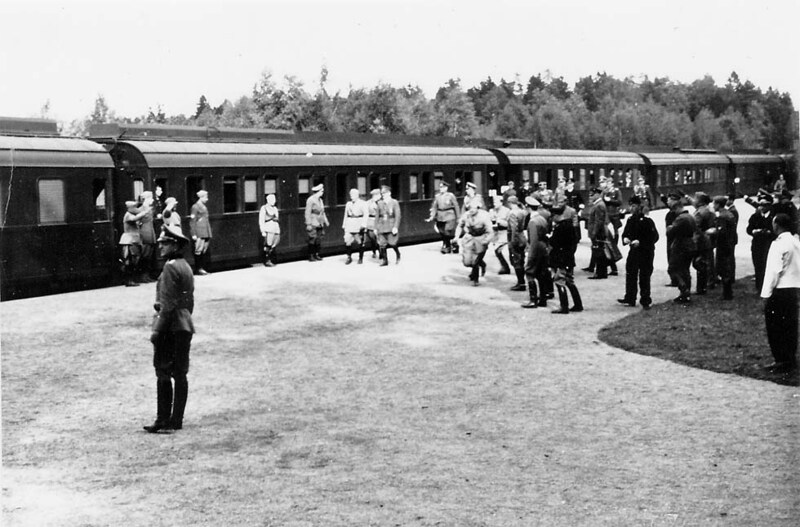 U.S. Army expresses from Germany to Bremerhaven and to Mediterranean ports were the trains of the victorious forces. And there had been other British specials. 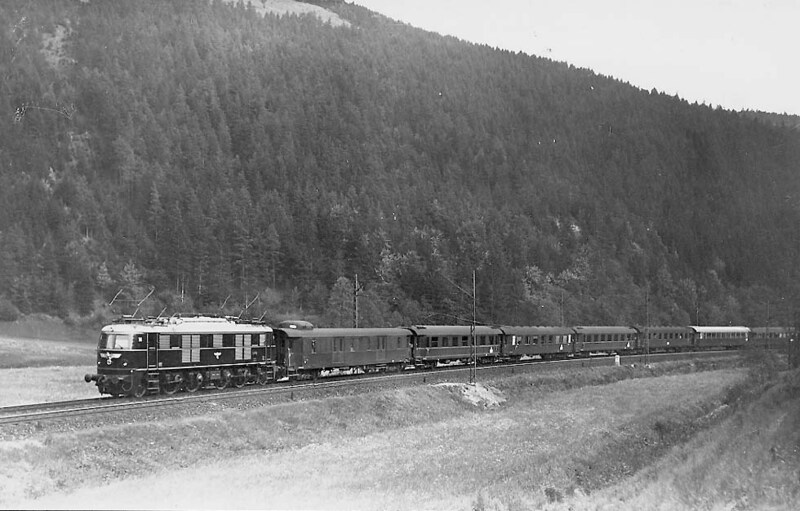 One of them was a commander’s train of the British Transport Commission (BTC) with streamlined saloons (built for the nazi bosses), which once in 1947 appeared on the Tegernsee-Bahn in the Bavarian Alps, hauled by the beautiful 2-6-4 tank engine no.8 of this private railway (designed by Krauss-Maffei’s chief engineer Lotter, who had dreamt of a Bavarian Niagara). From 1948 until 1951 (or 1952) there was a once-weekly regular express from Bad Oeynhausen headquarters or Hannover to Tegernsee with a branch detached at Augsburg for Ehrwald in Tyrol, including grey ex-Mitropa sleepers and diners. For us schoolboys in Tegernsee it was “Der Englische Zug”.